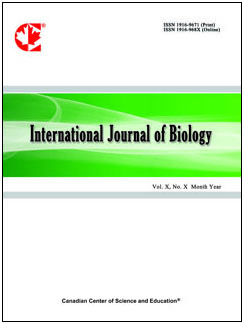 International Journal of Biology (IJB) is an international, double-blind peer-reviewed, open-access journal, published by the Canadian Center of Science and Education. It publishes original research, applied, and educational articles in the areas of biology. IJB is published in both printed and online versions, with indexing in Zoological Record (Thomson Reuters), AGRICOLA, CAB Abstracts, DOAJ, EBSCOhost, Google Scholar, LOCKSS, Open J-Gate, PKP Open Archives Harvester, ProQuest, Standard Periodical Directory, Ulrich’s, Universe Digital Library and WorldCat. Right now, the forthcoming issue is published in July 2013. It is a great pleasure to invite you to contribute your best knowledge and research. If you are interested, please find the journal’s profile at: www.ccsenet.org/ijb and submit your manuscripts online. Or you can send your paper directly to the e-mail: ijb@ccsenet.org. Authors are encouraged to submit complete, unpublished, original works that are not under review in any other journals. The scopes of the journal include, but are not limited to, the following fields: botany, zoology, cell biology, ecology, microbiology, genetics, physiology, hydrobiology, neurobiology, developmental biology, biochemistry, molecular biology and so on. If you have any question, please contact with the email at: ijb@ccsenet.org. It is appreciated if you could share this information with your colleagues and associates. Thank you.